The makeup of a green smoothie is simple. Nothing fancy is required. For Green Smoothie rookies, I recommend combining a few handfuls of spinach with a banana (for not only sweetness but also creaminess in the final product), strawberry slices and a splash of almond milk in a blender. Run it til it’s smooth and creamy, adding a little ice if you’d like. After that, the possibilities are endless: use kale instead of spinach or pineapple instead of strawberries, and on and on. Crafting your own Green Smoothie is a creative process and somewhat thrilling–no recipe or exact measurements are needed to create a supremely drinkable masterpiece. So besides grossing out your friends and roommates as you swig a drink that resembles sludge, why drink Green Smoothies? Green Smoothies allow you to gain the nutritional benefits of spinach or kale without forcing yourself to scarf down a bland salad. Why eat something that doesn’t taste good? 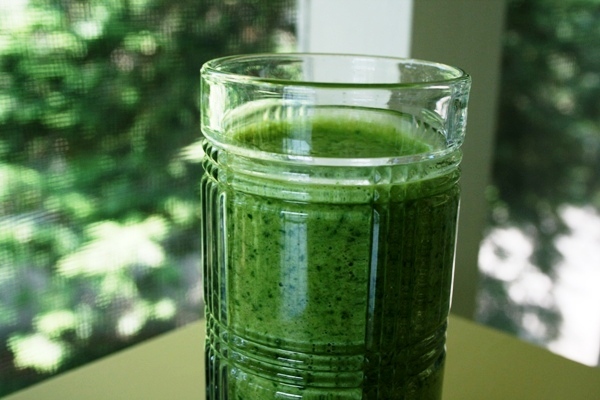 Campus fare is often limited when it comes to tasty, nutritious vegetables, but Green Smoothies are a delicious alternative and you will never have to question if you are eating enough veggies- just throw an additional handful of spinach (perhaps stolen from the dining hall’s salad bar) into your blender! Green Smoothies also provide energy and a sense of clarity…and what college student is not in need of an extra dose of both?! So maybe you are in a morning fog or an afternoon slump and you must endure marathon training or marathon reading of a Dickens’ book with a really bad cover. Drinking a Green Smoothie is an excellent start to productivity. Caroline Ariail is a senior at the University of Georgia where she studies journalism. Caroline is passionate about health and fitness as she is an avid runner who loves creating Green Smoothies of all kinds.